CCB'2004 Specification. Version 3.4.5, 10/21/2010. Corresponds to firmware of 10/21/2010. Configuration files .mcs and .svf for the XC18V02VQ44 EPROM. Version 09/15/2017 (232Fhex) for CCBs at p.5. Modified version of 03/25/2011 firmware with the possibility to mask out Hard Resets to individual boards in the peripheral crate. CSRB4=0/1 enables/disables Hard Resets to ALCTs. CSRB4=0/1 enables/disables Hard Resets to TMBs. CSRB4=0/1 enables/disables Hard Resets to DMBs. CSRB4=0/1 enables/disables Hard Reset to MPC. Default setting for these bits after power cycle is "0" (Hard Resets enabled to all target boards). The CCB must be in the "FPGA" mode (CSRA1=0 and CSRB1=0) to utilize these options. Archived version of this project is here. Configuration files .mcs and .svf for the XC18V02VQ44 EPROM. Version 02/25/2016 (205ahex) for the CCB at GIF++. Modified version of 03/25/2011 firmware. The delay between two consecutive L1A requests (to the peripheral backplane and front panel connector) is programmable by CSRB4(15:0): bit=25ns, bit=50ns, bit=100ns, bit=800us; max delay = 1.6ms. The block diagram of possible L1A_Request sources is here. Archived version is here. Configuration files .mcs and .svf for the XC18V02VQ44 EPROM. Version 01/15/2016 (202Fhex) for the CSCTF crate. Simplified version of 03/25/2011 firmware. Only one source of L1A_request in CSRB1 is uncondionally enabled (from the TMB/SP). Bits 2-7, 11-15 in CSRB1 are not used. Archived version is here. Configuration files .mcs and .svf for the XC18V02VQ44 EPROM. Version 03/25/2011 (1679hex) (same as version 10/21/2010, but compiled with the ISE 10.1.3). Archived version is here. Configuration files .mcs and .svf for the XC18V02VQ44 EPROM. Version 03/09/2015 (1E69hex) for OSU tests only. Same as version 03/25/2011 with two modifications: the L1A delay is now increased from 8 to 10 bits CSRB5[9:0] and the ALCT/CLCT delay is reduced from 8 to 6 bits CSRB5[15:10]; compiled with the ISE 10.1.3. Configuration files .mcs and .svf for the XC18V02VQ44 EPROM. Version 10/21/2010 (1555hex) (same as version 08/21/2008 with two modifications: CSRB20 was removed; CSRB19 expanded to 32 bits; compiled with the ISE 6.2.03). CCB'2004 Specification. Version 3.4.4, 04/30/2009. Corresponds to firmware of 08/21/2008. CCB'2004 Specification. Version 3.4.2, 04/02/2008. Corresponds to firmware of 02/15/2008. Configuration files .mcs and .svf for the XC18V02VQ44 EPROM. Version 02/15/2008 (104Fhex) (same as version 09/10/2007 with the CSRB19 (TTC_BRCSTSTR1_counter), CSRB20 (TTC_BRCSTSTR2_counter) and CSRB21 (TTC_DATSTR_counter) addeed). CCB'2004 Specification. Version 3.4, 06/27/2007. Corresponds to firmware of 09/01/2006, 03/05/2007 and 09/10/2007. Configuration files .mcs and .svf for the XC18V02VQ44 EPROM. Version 09/10/2007 (same as version 03/05/2007; L1A latency=2BX in both "discrete logic" and "FPGA" modes. Previously latency was 2BX in "discrete logic" and 3BX in "FPGA" modes). Configuration files .mcs and .svf for the XC18V02VQ44 EPROM. Version 03/05/2007 (same as version 09/01/2006 with fixed logic to generate the L1A on asynch_pulse). Configuration files .mcs and .svf for the XC18V02VQ44 EPROM. Version 09/01/2006 (Added feature: DMB_cfeb_calibrate[2..0] pulses may produce an L1ACC to custom backplane). CCB'2004 Specification. Version 3.2, 07/28/2006. Corresponds to firmware of 02/03/2006. Configuration files .mcs and .svf for the XC18V02VQ44 EPROM. Version 02/03/2006 (L1ACC can be generated from the rising edge of TMB_L1A_REQ or TMB_L1A_REL signals instead of falling edge in the previous versions of firmware). CCB'2004 Specification. Version 3.1, 04/12/2005. Corresponds to firmware of 01/15/2005. Configuration files .mcs and .svf for the XC18V02VQ44 EPROM. Version 01/17/2005. I2C Bus Specification. Version 2.1, January 2000. CCB2004 Xilinx project (zip) . Version 02/15/2008 (open with Xilinx ISE 6.2.03). CCB2004 Xilinx project (zip) . Version 08/21/2008 (open with Xilinx ISE 6.2.03). CCB2004 EPROM erase svf file. Configuration files .mcs and .svf for the XC18V02VQ44 EPROM. Version 12/24/2004. Configuration files .mcs and .svf for the XC18V02VQ44 EPROM. Version 10/13/2004 (added: expanded to 500 ns Hard_reset, CSRB18, "Reset TTCrx" command). Configuration files .mcs and .svf for the XC18V02VQ44 EPROM. Version 03/25/2004. Pin assignment for the boards in the EMU peripheral crate. A.Madorsky, 3 March 2001. CSC Track Finder Crate Specification. A.Madorsky, 12 December 2002. TTCvi-MkII Manual. Rev.1.6, May 2000. TTCvx Technical Description and Users Manual. May 21, 1999. TTCrq Mezzanine Card. Users Manual, Revision 0.1, February 2003. Developed by Karol Bunkowski of Warsaw University. 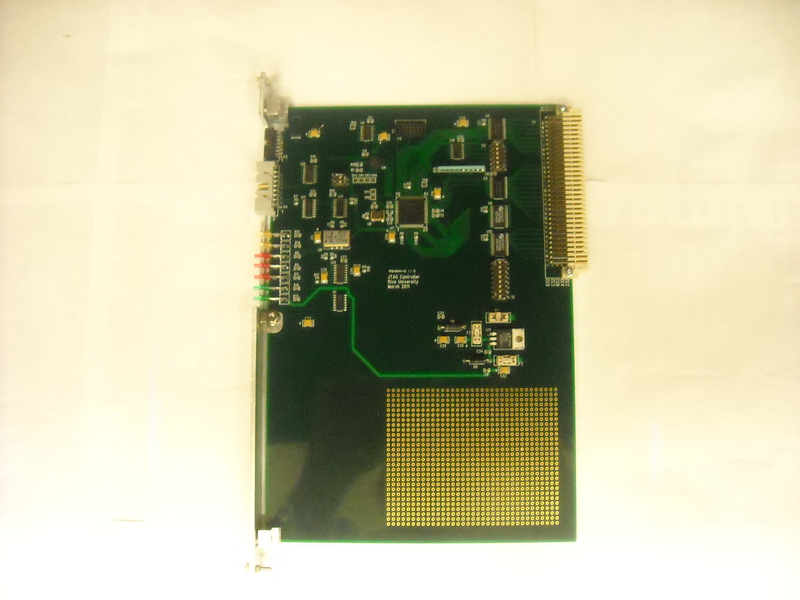 Tested in March'2002 at Rice University with the Model 617 and Model 618 PCI-to-VME Bus Adapters from SBS Technologies and CCB'2001 for the EMU Peripheral Electronics. TTCviCPP.zip contains C++ source files with TTCvi class (TTCviN.h file), which provides all functions needed to control TTCvi board and connected to it TTCrx boards. It also contains VME classes that are used to talk to VME via Bit3 interface (Bit 3 Model 983 support software) (files TVMEInterface.h and TVMEWinBit3.h). ConsoleTTCvi.zip contains the Microsoft Visual C++ project with the consol application that sets TTCvi for sending commands required by CCB. It may be treated as an example of using TTCvi class. With some small changes it should be possible to compile the files with any other C++ compilator. WinTTCvi.zip contains Windows GUI application (TTCContr.exe) that gives full control over TTCvi board. This is a first prototype of the CCB designed in 1999 for communication with the TMB'99, CLCT'99 and ALCT'99 prototype boards. This is the first prototype of the CCB for the CSC Track Finder crate. Three boards were built in summer 2000 and used at the University of Florida, UCLA and Rice for joint test of the Sector Receiver and Sector Processor modules. Will be replaced by the CCB'2001. The MPC resides in the middle of the peripheral EMU crate and receives trigger primitives from 9 or 8 Trigger Motherboards (designed at UCLA). MPC'2002 selects three best patterns out of 18 (or 16) and transmits them over three optical links to new combined Sector Receiver/Sector Processor board (designed at the University of Florida). Firmware revision 05/10/2010 (Based on revision 10/08/2008, but can disable specific TMB inputs by default (after power cycyling and hard reset). In the 10/08/2008 revision all the TMB inputs are enabled by default. Version mi (i=1..9) masks out one TMBi in the peripheral crate. CSR7 and CSR8 are not needed. Configuration mcs and svf files to mask off the TMB1. Configuration mcs and svf files to mask off the TMB2. Configuration mcs and svf files to mask off the TMB3. Configuration mcs and svf files to mask off the TMB4. Configuration mcs and svf files to mask off the TMB5. Configuration mcs and svf files to mask off the TMB6. Configuration mcs and svf files to mask off the TMB7. Configuration mcs and svf files to mask off the TMB8. Configuration mcs and svf files to mask off the TMB9. Configuration mcs file for the XC18V04 EPROM. Version 10/08/2008 (compiled with the ISE 6.2.03). Configuration svf file for the XC18V04 EPROM. Version 10/08/2008 (compiled with the ISE 6.2.03). Configuration svf file for the XC18V04 EPROM. Version 10/27/2006 includes the Board_ID[5..0] + Link_ID[1..0], CSR7 and CSR8, zero-quality LCT's with vpf=1 participate in sorting. Configuration svf file for the XC18V04 EPROM. Version 10/26/2006 (including Board_ID[5..0] and Link_ID[1..0], CSR7 and CSR8, zero-quality LCT's with vpf=1 do not participate in sorting). Configuration svf file for the XC18V04 EPROM. Version 04/26/2006 (including Board_ID[5..0] and Link_ID[1..0]). MPC2004 special project with the LFSR-based 15-bit PRBS generators for the optical links. Identical PRBS generators for all three links. PRBS generators run continuously after power cycling. Links need to be initialized by sending the L1Reset command. The generators are reset by the BC0 pulse which is transmitted as a 16th bit in the datastream from the MPC to SP. Interface to TMBs, sorter unit, FIFO_A and FIFO_B are not available. Simplified block diagram of the transmitter and receiver PRBS logic. BC0 in the transmitter part here is a 12.5 ns pulse derived from the 25 ns BC0 TTC command. Firmware for the MPC2004, version 05/20/2008. Same as 10/27/2006, plus 16-bit L1Reset counter added. Available for read (base address + B4). Reset on "FPGA Soft Reset command. Configuration svf file for the XC18V04 EPROM. Version 05/20/2008. MPC2004 Xilinx project (zip) . Version 10/27/2006 (open with Xilinx ISE 6.2.03). MPC2004 Xilinx project (zip) . Version 10/08/2008 (open with Xilinx ISE 6.2.03). Description of the modified MPC firmware (version 05/30/2004). Supports both "sorter" and "transparent" modes. In a "transparent" mode the MPC may send any incoming LCT (out of 18) to any optical link without sorting. This is the first prototype of MPC designed in 2000. The board is able to receive up to six trigger primitives from three Trigger Motherboards TMB'99, select three best and transmit them to Sector Receiver prototype designed at UCLA in 2000. The boards were used at the University of Florida for joint tests with a prototypes of Sector Receiver and Sector Processor modules. Muon Sorter receives up to 36 reconstructed muon primitives from 12 Sector Processors, selects the four best and transmits them to the Global Muon Trigger crate for further processing. Muon Sorter resides in the middle of the Track Finder crate and communicates with the Clock and Control Board (CCB) and Sector Processors over custom backplane. Configuration files (.mcs) for XC18V04 EPROM1, EPROM2, EPROM3, EPROM4, version 03/25/2011 (same as version 09/07/2009, but compiled with the ISE 10.1.3). Configuration svf file for all four XC18V04 EPROMs, version 03/25/2011 (same as version 09/07/2009, but compiled with the ISE 10.1.3). Configuration files (.mcs) for XC18V04 EPROM1, EPROM2, EPROM3, EPROM4, version 09/07/2009 (based on version of 03/31/2009 with four "rate" counters added, compiled with the ISE 6.2.03). Configuration svf file for all four XC18V04 EPROMs, version 09/07/2009 (compiled with the ISE 6.2.03). Configuration files (.mcs) for XC18V04 EPROM1, EPROM2, EPROM3, EPROM4, Trial version (based on version of 09/07/2009, compiled with the ISE 6.2.03). Configuration svf file for all four XC18V04 EPROMs, DATE_ID=169Dh (compiled with the ISE 6.2.03). Configuration jed file for the Xilinx XCR3128XL PLD, Version 17 August 2005. Configuration files (.mcs) for XC18V04 EPROM1, EPROM2, EPROM3, EPROM4, version 03/31/2009 (parity calculation for the GMT was changed from XNOR[29:0] to XOR[29:0]; trigger start/stop commands are not needed any more to send the BXN[2:0] bits from the internal bunch crossing counter to the GMT; bit CSR6 was specified to allow data capture from sorting unit to FIFO_D). Configuration svf file for all four XC18V04 EPROMs, version 03/31/2009. Configuration files (.mcs) for XC18V04 EPROM1, EPROM2, EPROM3, EPROM4, version 06/26/2007 (same functionality as version 07/31/2006, but more flexible control of the output RAM). Configuration svf file for all four XC18V04 EPROMs, version 06/26/2007. MS2005 Xilinx FPGA project (zip) . Version 09/07/2009 (open with Xilinx ISE 6.2.03). MS2005 Xilinx FPGA project (zip) . Version 03/31/2009 (open with Xilinx ISE 6.2.03). MS2005 Xilinx FPGA project (zip) . Version 06/26/2007 (open with Xilinx ISE 6.2.03). MS2005 Xilinx PLD project (zip) . Version 08/16/2005 (open with Xilinx ISE 6.2.03). CSC Track Finder Crate Specification. December 2002. [TRIAL VERSION] mcs configuration files for the XCF32P devices mcs EPROM1 and mcs EPROM2 and svf file and a compressed project file; Version 06/13/2018 (DateID=24CDh), based on version 05/05/2018, increased (up to 16K) FIFO_B_NEW buffers (loaded upon arrival of the TTC BC0), new QPLL_LOCK counter, 100 millisecond long IDLE pattern + 100 ns BoardID to EMTF links on Hard Reset. [TRIAL VERSION] mcs configuration files for the XCF32P devices mcs EPROM1 and mcs EPROM2 and svf file and a compressed project file; Version 05/05/2018 (DateID=24A5h), based on version 10/24/2017, increased (up to 16K) FIFO_B_NEW buffers (loaded upon arrival of the TTC BC0), new QPLL_LOCK counter. mcs configuration files for the XCF32P devices mcs EPROM1 and mcs EPROM2 and svf file and a compressed project file; Version 10/24/2017 (DateID=2358h), based on version 10/02/2016, GTP TX buffer disabled, BC0 counters added for all 9 TMBs (available for read from addresses 6000D2h (TMB1), 6000D4h (TMB2)... 6000E2h (TMB9), reset by RESYNC); simplified frame multiplexing to GTPs. mcs configuration files for the XCF32P devices mcs EPROM1 and mcs EPROM2 and svf file and a compressed project file; Version 11/28/2017 (DateID=237Ch), based on version 10/23/2016, GTP TX buffer enabled, BC0 counters added for all 9 TMBs (available for read from addresses 6000D2h (TMB1), 6000D4h (TMB2)... 6000E2h (TMB9), reset by RESYNC, minor changes in clock distribution w.r.t. ver 10/23/2017). mcs configuration files for the XCF32P devices mcs EPROM1 and mcs EPROM2 and svf file; Version 10/23/2017 (DateID=2357h), based on version 11/31/2016, GTP TX buffer enabled, BC0 counters added for all 9 TMBs (available for read from addresses 6000D2h (TMB1), 6000D4h (TMB2)... 6000E2h (TMB9), reset by RESYNC). mcs configuration files for the XCF32P devices mcs EPROM1 and mcs EPROM2 and svf file; Version 10/02/2017 (DateID=2342h), based on version 11/30/2016, minor changes in the BC0 path; BC0 counters added for all 9 TMBs (available for read only from addresses 6000D2h (TMB1), 6000D4h (TMB2)... 6000E2h (TMB9)). mcs configuration files for the XCF32P devices mcs EPROM1 and mcs EPROM2 and svf file; Version 11/30/2016 (DateID=217eh), based on version 10/17/2016, TX buffer disabled, tighter timing, improved GTP initialization, supports TMB-to-MPC data transmission tests for new links. mcs configuration files for the XCF32P devices mcs EPROM1 and mcs EPROM2 and svf file; Version 11/31/2016 (DateID=217fh), based on version 10/18/2016, TX buffer enabled, tighter timing, supports TMB-to-MPC data transmission test for new links. mcs configuration files for the XCF32P devices mcs EPROM1 and mcs EPROM2 and svf file; Version 10/18/2016 (DateID=2152h), based on version 07/06/2016, TX buffer enabled, tighter timing. mcs configuration files for the XCF32P devices mcs EPROM1 and mcs EPROM2 and svf file; Version 10/17/2016 (DateID=2151h), based on version 07/06/2016, TX buffer disabled, tighter timing, improved GTP initialization. mcs configuration files for the XCF32P devices mcs EPROM1 and mcs EPROM2 and svf file; Version 07/06/2016 (DateID=20E6h), based on version 11/18/2014, TMB1_LCT0_BC0 bit is transmitted in frame 2, line of all 8 optical links. Archived version is here. mcs configuration files for the XCF32P devices mcs EPROM1 and mcs EPROM2 and svf file; Version 11/18/2014 (Pre-production) (DateID=1D72h), based on version 09/22/2014, TXENPMAPHASEALIGN=1, TX buffer disabled, VME access counter added. mcs configuration files for the XCF32P devices mcs EPROM1 and mcs EPROM2 ; Version 12/14/2015 (Trial) (DateID=1F8Dh), based on version 11/18/2014, Intended for latency measurements. TP15 is connected to bit D(11) of the GTP link 1 input (MGTTX0_101); it includes the TMB2_LCT1_VPF bit. mcs configuration files for the XCF32P devices mcs EPROM1 and mcs EPROM2 and svf file; Version 11/30/2015 (Trial) (DateID=1F7Eh), based on version 11/18/2014, Nine BC0 counters added for LCT0 from TMB1-TMB9; available for read from addresses base+d2, base+d4... base+e2. mcs configuration files for the XCF32P devices mcs EPROM1 uncompressed and mcs EPROM2 uncompressed and svf file; Version 09/11/2014 (Trial) (DateID=1D2Bh), based on version 08/22/2014, IDLE generation has been modified, default reset of GTPs added, access to AFBR-810 internal registers added. mcs configuration files for the XCF32P devices mcs EPROM1 uncompressed and mcs EPROM2 uncompressed and svf file; Version 08/22/2014 (DateID=1D16h), based on version 08/21/2014, but resynch procedure is similar for both new and old optical links. mcs configuration files for the XCF32P devices mcs EPROM1 uncompressed and mcs EPROM2 uncompressed and svf file; Version 08/21/2014 (DateID=1D15h), modifications in the TTC decoder, the rest is identical to version 04/08/2014. mcs configuration files for the XCF32P devices mcs EPROM1 uncompressed and mcs EPROM2 uncompressed and svf file; Version 04/07/2014, all TMB inputs are unconditionally enabled (DateID=1C87h). mcs configuration files for the XCF32P devices mcs EPROM1 uncompressed and mcs EPROM2 uncompressed and svf file; Version 04/08/2014, TMB inputs are enabled in CSR7 (DateID=1C88h). mcs configuration files for the XCF32P devices mcs EPROM1 uncompressed and mcs EPROM2 uncompressed; Version 12/11/2013 (DateID=1B8Bh), unified (August 2013) MPC-to-SP data format for all CSC chambers. MPC-to-SP unified data format for all CSC chambers xlsx file; (August 2013). Configuration files (.mcs) for the XCF32P devices EPROM1 and EPROM2 Version 05/16/2012 (DateID=18B0h) (TX buffer disabled, IDLE pattern added, adjustable clock to GTPs, GTP RX error counters added). Configuration files (.mcs) for the XCF32P devices EPROM1 and EPROM2 Version 04/13/2012 (DateID=188Dh) (TX buffer enabled, IDLE pattern added). Configuration files (.mcs) for the XCF32P devices EPROM1 and EPROM2 Version 04/13/2012 (DateID=188Dh) (TX buffer disabled, IDLE pattern added). Instruction for the Irradiation Test, 9 May, 2012 and ISE 13.4 Project. Muon Tester board is intended for testing of the CCB, MPC and MS boards. Board schematic (VME and custom backplane interfaces). This board was built in the fall of 2005 and intended for evaluation of the Texas Instruments TLK3101 gigabit transceivers and Finisar FTRJ8524 optical modules operating at 160MHz. mcs file for XC18V02 PROM, version 12/10/2013; load FIFO_B on TTC command=30h. mcs file for XC18V02 PROM, version 02/07/2006. schematic pdf file, version 29 November 2005. 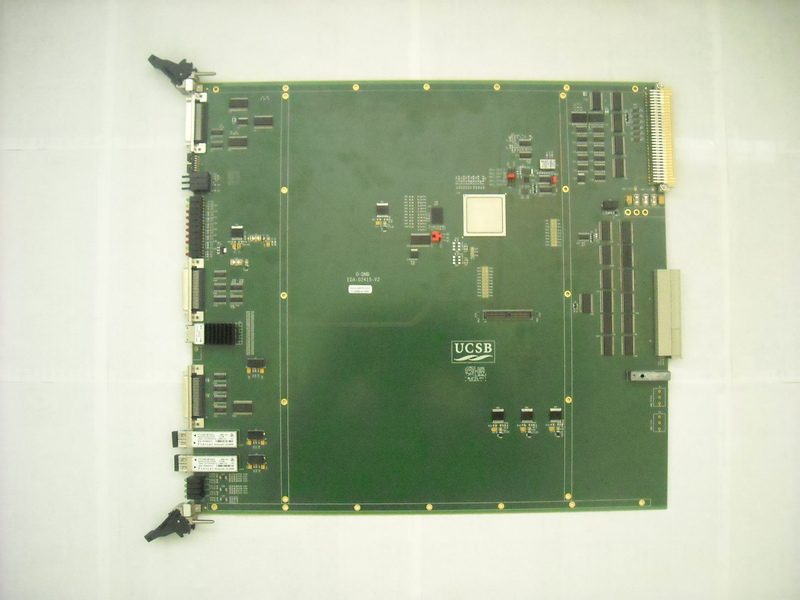 This board was built in spring 2001 and intended for evaluation of the Texas Instruments TLK2501 gigabit transceivers and Finisar FTRJ-8519 optical modules. M.Matveev, T.Nussbaum, P.Padley, J.Roberts, M.Trapathi. Optical Link Evaluation for the CSC Muon Trigger at CMS. Published in Proceedings of the Seventh Workshop on Electronics for LHC Experiments. Stokholm, Sweden, 10-14 September 2001. This board was built in spring of 2011 for evaluation of the National Semiconductor SCANSTA101 JTAG Master.